Rattlesnakes in eastern Washington are western rattlesnakes or Crotalus viridis. Several subspecies of western rattlers inhabit western and midwest states such as the northern Pacific rattlesnake or Crotalus viridis oreganus in Washington, Oregon and California; prairie rattlesnake or Crotalus viridis viridis inhabiting a swath east of the Rocky Mountains from the Dakotas to Texas, and great basin rattlesnake or Crotalus viridis lutosus and others inhabiting the desert southwest. The map below shows areas with habitat favorable to western rattlesnakes in Washington State based on ecological region, land cover and elevation, courtesy of the University of Washington. Where are rattlesnakes found in Washington State? The rattlesnakes encountered in eastern Washington typically display fear of people and slip away, rattling meekly, or they may act docile -- staying put and remaining quiet when approached-- this behavior seems typical during cooler times of day or night, and/or when damp. They're more jumpy in the heat though. These rattlesnakes are are a little over two feet long, many between one and two feet. Their color can be brown against a tan/white background to olive against a dusty light green background. 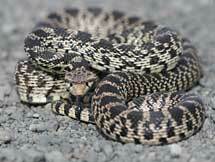 Rattlesnakes make a distinctive sch-sch-sch-sch rattling sound when disturbed. Grasshoppers may make a similar sound, more like rapid clicking than rattling. To listen to a rattler recording, click the recording of an Eastern Washington rattlesnake. Epidemiology and the Risk of Snakebite. Talk to kids pointedly about snakes-- let very young ones know snakes can bite and that bites will hurt, and especially try to impart good judgement to teenage boys to help dissuade them from poking with sticks or counting coup. Instilling some fear is good but promoting phobia is not -- exaggerated fear can result in an inability to take basic precautions, instill shock as the response to minor situations, and can last a lifetime. Write down phone numbers and locations for the nearest hospitals and clinics where you're going. Bring a cell phone when you're out & about, if you have one-- it may not work everywhere you go but may come in handy in open country where there's a good signal. This page is provided for people who live east of the Cascade mountains or are interested in visiting eastern Washington just to explore, or to search out and see these beautiful animals in their natural environment. There's little to worry about and much to look forward to seeing, and it's always a better to be prepared and not need it than need it and not be prepared. For more information about rattlesnakes, snakebite and children, and to see what other wildlife can be seen in eastern Washington, follow the related links to the left.